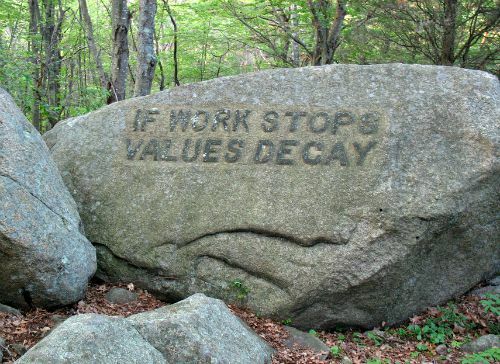 Dogtown today stands as a long abandoned settlement hidden quietly in the woodlands of Gloucester, with the only remaining features being a few foundation lines and artistically engraved boulders. Settled in 1693, the area was not a particularly good spot to make a village in terms of productivity, as the whole settlement was started atop a huge rocky cape. It was however quite safe, being far enough inland to be away from any pirate activity, and out the way enough to be of little interest to the Indian forces in the area. At its peak between 1750 and 1800, it had a population of around 100 families and everything seemed to be going so well for the community. This would all change at the start of the war of 1812, when new coastal roads and less activity from the Indians meant new, more farmable and profitable areas were available to live in, and that combined with the fact it was in range of coastal bombardment led many families, especially those that farmed to leave the settlement. The village became almost abandoned by the end of the war, with only a few of the widows of soldiers and sea goes remaining, along side various drifters and criminals that took refuge in the free empty housing. During this time the area got itself a very bad reputation, with unemployment being almost everybody and crime was commonplace. The widows who stayed here were known to keep dogs for protection, often in quite large numbers and after the owners died the dogs were simply left to look after themselves, this is thought to be the reason the settlement became known as dog town. Now the area stands completely covered by woodland and has many trails and good hiking routes throughout, and is of course open to the public all year round. It was the last residents of Dogtown that are believed to be responsible for the hauntings here. It was widely suspected that the last few residents were involved in witchcraft, with one such woman known as Thomazine "Tammy" Younger gaining the nickname of "Queen of the Witches". The story's about her claim she would place curses on the oxen teams transporting fish across the bridge from the harbor unless they pay here a toll. The very last person to call Dogtown home was a man named Cornelius "Black Neil" Finson. He is thought to be a drifter who found his way there and occupied an empty home, but when he was found he was sitting in rags and half dead living in a cellar, he was taken to a nearby poorhouse but died shortly afterwards. It is the spirit of this man who's thought to be responsible for scaring so many hikers here, with people claiming to see his ragged apparition sitting by the side of some of the trails staring at people, only to vanish if approached. As for the actual number of ghosts here it would be anyone's guess. People have made all kinds of claims, with everything from pirates and witches to former slaves and strange faceless voices calling out to them. One such incident about the voices in the trees comes from 1984, when a homeless man murdered a school teacher here when she was walking her dog. The homeless man crushed her skull and when later questioned claimed the voices in the woods were calling out for him to do it.